Rahul Dravid has always been criticised for being very slow in scoring the runs. When he started his career,he was not fast in scoring the runs in ODIs.He was criticised throughout his career for the same reason. In Tests,he is suitable player.With solid technique,he has the capacity to stand on the pitch for a full day.But,several times in his career, he was made target for India's defeat,because he played with very slow strike rate (around 5-10 %).Sometimes, such slow innings may change the mindset of the team. 1.Lack of aggression in captaincy. 2.Declaring the innings when Sachin was not out on 194. 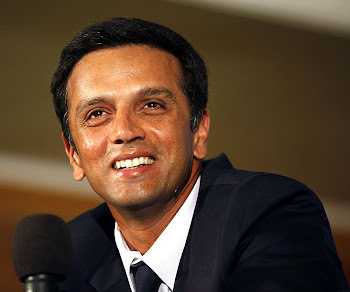 One of Dravid's most debated decisions was taken in March 2004, when he was standing in as captain for an injured Sourav Ganguly. The Indian first innings was declared at a point when Sachin Tendulkar was at 194 with 16 overs remaining on Day 2. 3.Rahul Dravid has had a mixed record when leading India in Tests. India lost the Karachi Test in 2006, giving Pakistan the series 1-0. In March 2006, India lost the Mumbai Test, giving England its first Test victory in India since 1985, enabling Flintoff's men to draw the series 1-1. While the loss in Karachi could be put down to several Indian batsmen playing badly, the defeat in Mumbai was arguably the result of Dravid's decision to bowl first on a flat dry pitch which later deteriorated and ended with an Indian collapse in the run chase. 4.After India failed to qualify for the Finals of the DLF Cup, Indian skipper Rahul Dravid was criticised by former all-rounder Ravi Shastri who said that he was not assertive enough and let Greg Chappell make too many decisions. When asked for a response, Dravid said that Shastri, while a 'fair critic', was 'not privy' to the internal decision-making process of the team. 5.Under his captaincy, India exited from the World Cup in the first round itself. Who was responsible for the declaration in March 2004? Though Rahul was a Stand-in Captain, it was Saurav Ganguli who had signalled the declaration even before Rahul took the decision. Pls. let me know the truth on rustomhavewalla@gmail.com Thanks.